"A Scout earns his own way!" Want to earn money towards Summer Camp, Uniforms, Campout Costs?? Troop 740 has developed the ability to open your 'Scout Account" today! Interested parties please contact the Troop Fundraising Committee! 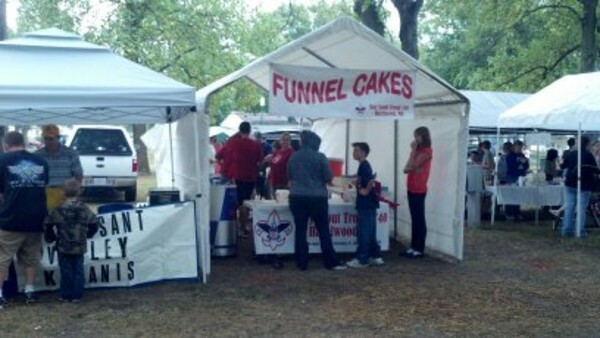 Every year Troop 740 hosts our annual Hazelwood Harvestfest Funnel Cake booth. The Harvestfest fundraiser is one our biggest events of the year and it is important that every scout volunteer time to ensure a smooth, enjoyable process for all. The troop is always looking to host events outside of the Harvestfest. If you have any suggestions, please let the fundraising chair know. Throughout the year, the troop participates in multiple Pizza sales such as Dogtown pizza and TJ's Pizza. These are great money earning opportunities that the youth will have a chance to increase their scouting accounts.